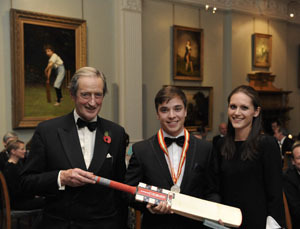 While lingering fireworks lit up the chilly night of November 6, a warm glow prevailed inside a packed Long Room at Lord’s as the batting pyrotechnics of the 2014 Walter Lawrence Trophy winners were celebrated in style. 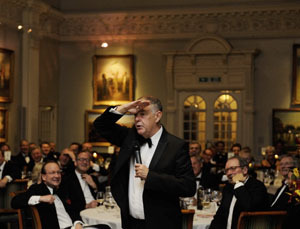 Following a sparkling reception, courtesy of Veuve Clicquot, genial host John Barclay enlivened the proceedings with his inimitable merrymaking and, after the presentations, former England & Derbyshire off-spinner and England selector, Geoff Miller, rounded off the evening with a rollicking after-dinner speech. 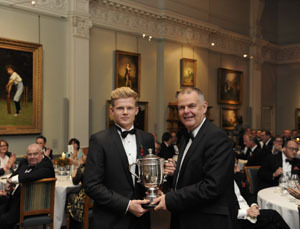 The main Walter Lawrence Trophy, awarded for the fastest hundred of the season, was won jointly by Kent’s Sam Billings and Middlesex’s Dan Christian with both men having scored 46-ball centuries. 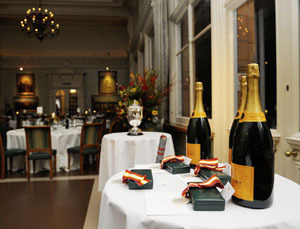 Sharing prize-money of £3,000 they are the fourth pair of joint-winners in the competition’s history. Billings, a product of Loughborough MCCU, made his dashing hundred in the Royal London One-Day Cup match against Somerset at Taunton on July 31. Coming in at number seven, the 23-year-old Pembury-born wicket-keeper smashed 12 fours and 4 sixes in his century, going to finish unbeaten on 135, made off 58 balls. He remembers the innings as being, ‘A complete blur. It was one of those days when I thought I could hit every ball for 4 or 6’. Voted Kent’s Player of the Season, Sam has been named in both of the provisional England Lions squads to tour South Africa in 2015. Billings was presented with the Trophy and prize money by guest speaker Geoff Miller. Earlier in the season, Sydney-born Christian, who was unable to attend the Dinner, hit 9 fours and 8 sixes in his hundred against Kent in the NatWest T20 Blast game at Canterbury on June 6. The 31-year-old all-rounder has represented three State sides in Australia, and played in 19 One-Day Internationals and 15 T20 Internationals for his country. 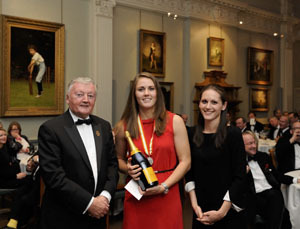 Natalie Sciver pipped her England captain, Charlotte Edwards, to claim the 2014 Walter Lawrence Women’s Award, which is won by the batsman who makes the highest individual score in a season. The 22-year-old hit 154 off 151 balls for Surrey Women against Nottinghamshire Women in the Royal London Women’s One-Day Cup game at Reed’s School Ground, Cobham on July 20. Her score, which included 22 fours and 1 six, represented almost 64 per cent of her team’s total as Surrey held on to win by 7 runs. Charlotte Edwards had previously been in pole position with a score of 151 – one of three centuries she made during the season. Natalie, who was born in Tokyo and lived in Poland between the ages of 6 and 9, has represented England at Test, One-Day International and T20 International level and is regarded as a big hitting all-rounder with a bright future. She is currently studying Sports and Exercise Science at Loughborough University, and in February tours New Zealand with England for a five-match One-Day International series and three-match Twenty20 International series. Natalie is the third winner of the Walter Lawrence Women’s Award since it was introduced and received a silver medallion and a cheque for £500 from MCC President, David Morgan. The Walter Lawrence MCC Universities Award for 2014 was won by Durham’s Rob Gibson. His innings of 118, the highest against one of the other five MCCUs or against one of the first-class counties, was achieved on the final day of the 2-day Championship, against Cardiff MCCU at Usk CC on June 13. Replying to Cardiff’s impressive total of 423-7, the 20-year-old right-handed opener shared an opening stand of 167 and then 61 before being adjudged lbw. Gibson’s 118, scored off 217 balls and including 15 fours, provided a platform for Durham to draw the game and finish on 348 for 8. Born in Emsworth and educated at Portsmouth Grammar School, Gibson also bowls leg-breaks and played regularly for Hampshire Second XI last season. A sports degree student, Gibson is the third Durham MCCU player in four seasons to win the prestigious Award, following in the footsteps of 2011 winner Somerset’s Chris Jones and last season’s recipient Ivo Hobson. 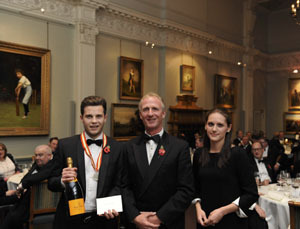 He was presented with a special silver medallion and prize of £500 by Matthew Fleming. Mark Eteen, with an unbeaten 147, is the winner of this year’s Walter Lawrence Schools Award, for the highest score by a school batsman against MCC. With The Royal Grammar School, High Wycombe, needing a total of 246 to win on June 18, Eteen produced a monumental innings of clean hitting, which included 22 fours and 1 six, taking the game to the last over before losing agonisingly to MCC by 1 run. Eteen, who averaged over 90 this season, now holds the record for the most centuries scored at the school, 9, including 4 for the First XI. Mark, the fourth winner of the Schools Award, was presented with a special medallion and a Gray-Nicolls cricket bat by Brian Thornton.